Temescal Art Centre in Oakland present Anton Well's Theater Company production of 4.48 Psychosis. It is on from 20 Jul-5 Aug 2018. 4.48 Psychosis will be performed at the Buffalo Room in the Westport Flea Market, Kansas City from 13- 23 Nov 2014. Iron Crow Theatre present 4.48 Psychosis at Theatre Project, Baltimore from 4- 18 Oct 2014. The director is Ryan Clark and the actors are Nick Horan, Katie Keddell and Ché Lyons. Dramaturge is by Meggie Twible, movement Nick Horan, lighting Alec Lawson, projections Travis Levasseur, sound Ryan Clark and stage managers Heather Peacock and Ally Haley. "In one last act of love to the theatre, she wrote what many consider her greatest achievement, 4.48 Psychosis. She gives us an insight of the human brain in the place between life and death questioning the validity of suicide. The play is written in a manner, which is not realistic or linear but rather abstract and disjointed, which is appropriate when dealing with issues of mental health—the rational does not apply. Through the use of video, projections and abstract movement, Iron Crow will attempt to navigate the human brain through Kane’s text in this highly stylized production." 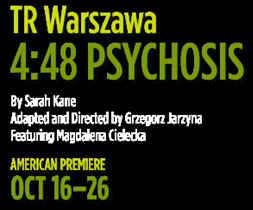 TR Warszawa present their Polish language 4.48 Psychosis at St. Ann’s Warehouse, Brooklyn from 16- 26 Oct 2014. There are English surtitles. "Anchored by a tour de force performance by Magdalena Cielecka, one of Poland’s most revered contemporary actresses, TR Warszawa’s acclaimed 4:48 Psychosis, a lacerating and lyrical depiction of a mind on the edge, comes to St Ann’s for its first and only American engagement. British playwright Sarah Kane’s extraordinary final work swings from elation to despair as it chronicles a convincing, lucid argument of isolation vs. non-existence." So far there are two productions of 4.48 Psychosis planned for the USA in 2010. 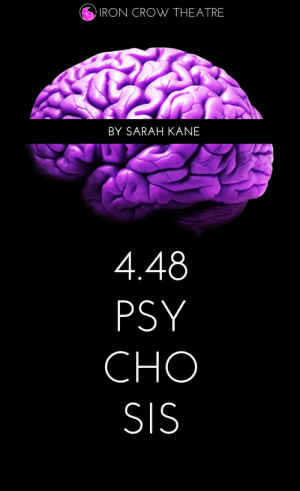 - a student 4.48 Psychosis performed as part of Undergraduate Student Projects in the KU University Theatre (Kansas University).